Gene Simmons has confirmed to the "Lipps Service" radio show that KISS's upcoming "End Of The Road" tour will indeed be the band's last. "The answer is yes, and I'll tell you why," Gene said (see video below). "It's always interesting marketing when you say, 'I promise,' and all that. KISS is the hardest-working band in show business — period. It doesn't mean we're the best, although we call ourselves that. But I wear about seven-inch platform dragon boots. Each one weighs 10 or 11 pounds. That's 20-plus pounds on the legs. It's like working out with bowling balls. Then on top of that, there's another 30 pounds or so between the armor [and the rest of the outfit]. And so if you put [Mick] Jagger and Bono — [who are] both great — in my outfits, they'd… like little girls, they'd fall down… They can't do this. And I've gotta spit fire and fly through the air and all that. It is physically exhausting… So the idea is go out with some dignity." It was back in 2005 that KISS manager Doc McGhee first told the New York Times that the group had "been toying with the idea of recruiting an entire band to don the band's famous makeup." McGhee said: "KISS is more like Doritos or Pepsi, as far as a brand name is concerned. They're more characters than the individual person. I think [new members] have a legitimate chance to carry the franchise." 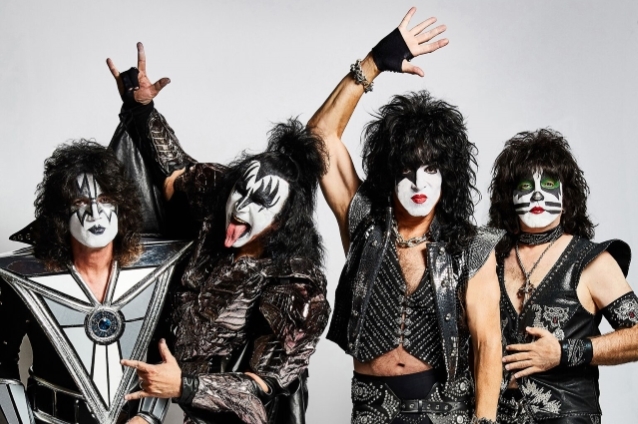 Earlier this year, KISS frontman Paul Stanley once again reiterated his belief that the band can one day carry on without any original members, including him and Simmons. He told the Los Angeles radio station 95.5 KLOS: "I think that KISS is a concept, it's an ideal, it's a way of performing and giving to an audience, and that goes far beyond me." He continued: "I'm a big fan of mine — I think I'm really good at what I do — but it doesn't mean there's not somebody else out there who can bring something to the band. Not a clone, not somebody copying me, but I was influenced by a lot of people, so there's people out there who are influenced by me." Two years ago, Stanley spoke about how he would go about finding someone to replace him in KISS. He said: "Honestly, I think all the KISS tribute bands are great, but none of them have a good 'Paul.' So I'd like to see somebody who incorporates what I've done with a lot of the things that inspired me. And it's not a matter of a puppet being me; it's somebody who comes in and contributes and adds something new to it while still following the template that's been set."